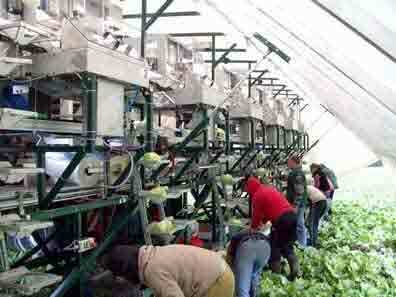 Harvest and postharvest in the field: vegetables are picked, washed, wrapped, weighed and labelled in one place. These processes all take place inside mobile units, which are used across Europe. 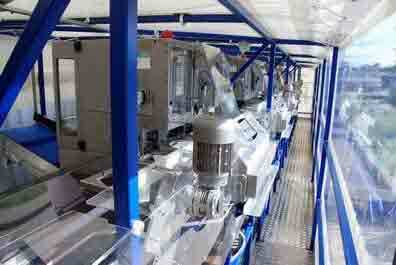 BRIMAPACK speeds up the field to fork process. Vegetables like lettuce, broccoli, cabbage and cauliflower are highly perishable products, and have a very short shelf life, usually around six days after harvest. A normal harvest consists of removing the vegetables from the ground, placing them into plastic crates and transporting them to cleaning, weighing and packing facilities. This usually takes around 24 to 36 hours (more than 20% of the already short shelf-life), with the by-product of the cleaning process (the damaged outer layers that are trimmed off) being transferred to the packing station, before they are disposed of elsewhere. All of the vegetables displayed below were harvested, cleaned, weighed, labelled and boxed in the field, using one of Brimapack's mobile harvesting units. Instead of transporting the harvest in plastic boxes to a fixed packing station, the packing station comes to the field. These mobile and adaptable units drive slowly through the field, where the cutters, in front of the unit, cut and clean the produce by hand and place it in the front end of the unit. The produce is then lifted inside the mobile unit, where it is cleaned (the damaged outer layers are removed) and placed into the packaging machine. After being wrapped, the finished product is weighed, labelled and placed into boxes, ready to be transported directly to supermarket chain storage facilities, for example. The cuttings from the cleaning process are returned to the field, where after the harvest they are ploughed back into to the soil as organic material. The waste does not need to be handled or transported. What happens inside this self-propelled unit? 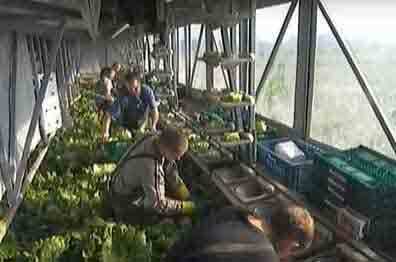 Take a closer look at how the produce is harvested and fed into the unit. It is cleaned, wrapped, weighed, labelled, and sorted into boxes, ready to be delivered straight onto the shelves of a shop or, in the case of a supermarket, to its central storage facility. Cutters working in the tent in front of the unit harvest the produce at its stem and place it into containers which take it to the cleaning and packaging area of the unit. The freshly harvested produce is lifted into an area where it is cleaned, before being moved into another set of containers to be automatically weighed, wrapped and labelled. Once wrapped, weighed and labelled, the produce is placed into boxes by hand. The waste cuttings are placed on small conveyors at either side of the cleaning equipment and returned to the field to the rear of the mobile unit. 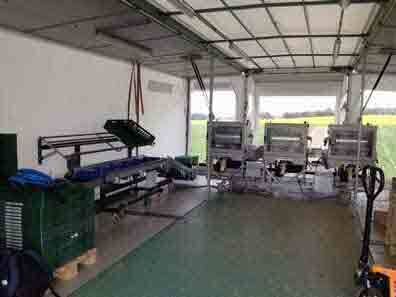 The packaging, weighing and cleaning equipment. Please watch the video to see the complete process. Once cleaned, wrapped, weighed and labelled, the produce is put into boxes by hand, and is ready to be transported from the field directly to stores or storage facilities. The whole installation can be monitored from a mobile phone. Many units are equipped with a very precise GPS system. 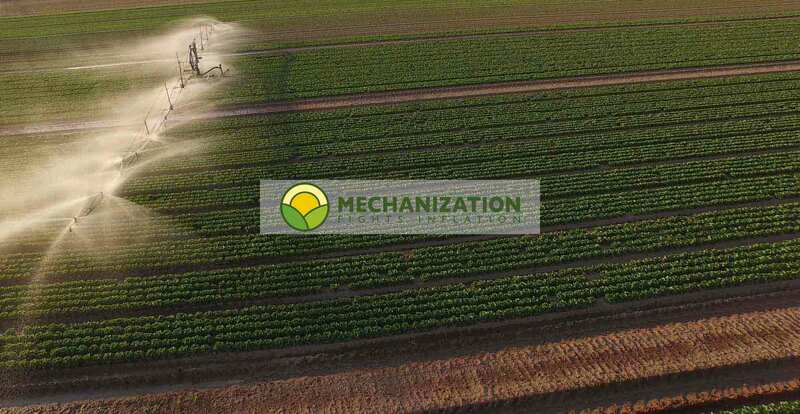 The coordinates of the harvest are fed into the system, and these coordinates are used to direct the entire harvesting unit across the field, taking the most efficient route, and avoiding any damage to the crop. How does the sructure look like from the inside? Each year, these mobile harvesting and handling units are first put to use in the south of Europe, where the harvest is earlier. They then follow the harvests up north, before working their way back south in preparation for the next year's harvest. These units are continuously active for nearly seven months of the year. 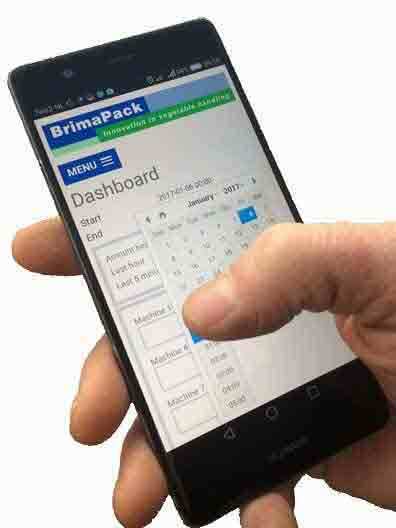 This page provides a small introduction into the technologies implemented by the company BrimaPack for handling and packing vegetables.